When you’ve got a beautiful view why hide it? Such was the thought of Rusty McClure about the stunning water feature in the back yard of his Columbus Ohio home. Imagine rushing waters colliding with rocks down a steep hillside with steps and landings leading to the Olentangy River – very cool and dramatic. With that being said Rusty saw even greater potential which could be gleaned from the landscape. The wooden stairs – while essential to travel down the hillside – were blocking the view of Rusty’s illuminated rushing water feature. Rusty thought why not open up the view with some glass stair treads? Learn below how Rusty combined the structural glass products obtained through Innovate Building Solutions with the expert installation team of Mike Shurig Remodeling to create one inspired landscape design! When you’re talking about glass stairs supporting people walking over water and rocks not just any old piece of glass will do! The glass must be structurally safe and able to withstand the tough Ohio change of seasons. 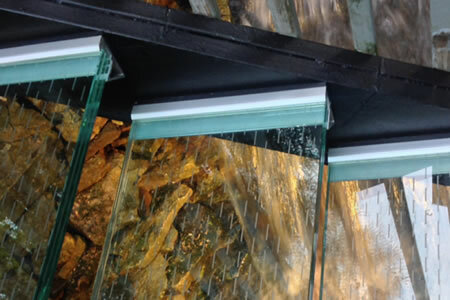 For this project a 1” thick piece of structural laminated glass was chosen. The top ½” of glass is tempered with a laminated inter-layer in the center with heat treated glass at the bottom creating a durable glass flooring system. In order to ensure the top surface was safe to walk on (not slippery) – yet provided a clear view to the water feature below – glass frit was added in a “horizontal perforation” pattern for anti-skid protection. While these 34” x 14” glass stairs are cool it’s critical they have a robust bracketing system made of the right material to support the treads and withstand the outside elements. This project used a clean, contemporary aluminum bracket system with silicone cushions for the glass to sit on top of. They are cool looking and safe! • Step 1 – The old wood steps were removed which were held in by lag screws and metal brackets. The stair runners were secured with new lag screws. • Step 2 – Andy and Mike made did a preliminary layout to make sure each step would be evenly spaced. • Step 3 – The steps were done one at time. A bracket was bolted on each side and a wood template was placed across the runners to make sure each stair would be level. • Step 4 – The bottom cushion was placed inside the bracket and the glass stair tread was placed on top. • Step 5 – The top cushion and top cap were placed over the glass stair treads. Now that you’ve read more information about glass stairs and their installation steps would you be bold enough to want a glass floor? To learn more about supply of structural glass floors or glass treads or get a free estimate call Innovate Building Solutions on a nationwide basis (877-668-5888) or for a local project their divisions including Columbus Glass Block (614-252-5888) and Cleveland Glass Block (216-531-6363).